Mozilla Firefox is a web browser that offers external add-ons that provide great social bookmarking and social networking functionality. These tools are free and can provide better social media and social networking experience to both webmasters and average internet users. Below are the top five Firefox Add-ons that can enhance your social networking and social media experience using Mozilla Firefox web browser. 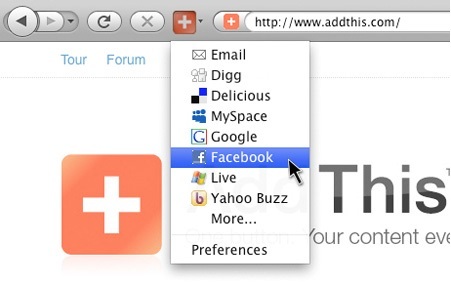 AddThis – AddThis is among the most downloaded Firefox Add-ons. This add-on provides efficient functionality for sharing online content and social networking web pages, as well as supports Mozilla Firefox 2.0 up to 6.0 versions. This is among the Firefox Add-ons that are highly customizable, enabling you to share a context menu, navigation toolbar button, and a toolbar. Yoono – This add-on supports different platforms, which include all social networking websites such as GoogleBuzz, Facebook, Foursquare, Twitter, MySpace, LinkedIn, YouTube, Yammer, and more. This is an add-on that allows users to share everything as well update their status across different social networking platforms. WiseStamp – This add-on serves as an email tool that users can use for multiple email signatures and provides support to all primary web email services including Yahoo Mail, Gmail, and Hotmail. Also, this add-on supports few of the popular email platforms such as Thunderbird, an email platform that can be used as an AOL website email client, and a standalone email client. This means that this add-on will enable you to popularize your blog or website through multiple email accounts. Shareaholic – This add-on supports all social networking platforms as well as applicable to all web browsers. The primary advantage of this add-on is that it does not require to you to comply with compulsory registration policy. This means that you do not need to register in order for you to use the add-on. LinkedIn Companion – This is an add-on that is designed exclusively for users using LinkedIn. This can provide access to profiles of people who are sending you emails via your LinkedIn account. It also supports several job search engines, enabling you to view links to the profiles of LinkedIn members who are linked to employers. This add-on is an efficient tool for LinkedIn users who want to maintain and expand their contacts. You can find hundreds to thousands of social bookmarking and networking Firefox add-ons on Mozilla’s website and on sites like LatestVersionPlugin which provides detailed reviews and research on Mozilla’s Firefox Plugins. However, these five Firefox Add-ons are the best tools to use to share your web pages with your friends and colleagues, or to publicize your online content. Related to "Top 5 Firefox Social Add-ons"